You are at:Home»Courses»No time for Higher Studies? Here is LL.M. without spending yet more years in college. After years in college spent to earn the LL.B. degree, many don’t have the option of spending a few more years to earn the masters degree. But what if we can get a Master Degree without devoting more years of life remaining just a student? If that prospect excites you, read on! There are a number of Law Colleges which offer Distance Learning opportunities, but most of them award a diploma on completion. 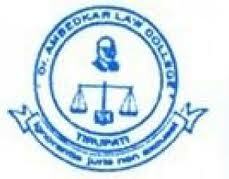 But Dr Ambedkar Law College offers Two-Year LLM (Master of Laws) in four branches specialisation though Centre for Distance Education of Acharya Nagarjuna University, Gunturand this is UGC Recognised. Next Article Centre for Juridical Studies, Dibrugarh University – Admission to LL.M.